In the past whenever we had guests come to visit, my daughter was usually the one to give up her room for them. 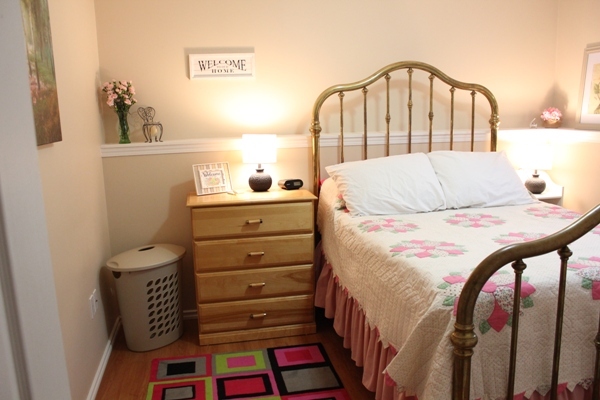 It was quite a process getting her room organized and ready to be used as a cozy guest room each time that is for sure. Now that she no longer lives at home I now have a dedicated guest room ready and waiting which makes things a little easier. Since all of our family lives away from us I’m always wishing they’d come more often to visit. I like to make guests feel as comfortable as possible when they do come so they won’t hesitate to return. Although some of you might be trying to avoid that, ha! In addition to the basics like comfy pillows and sheets, here are a few other necessities that I think all guest rooms should have for a comfortable stay. 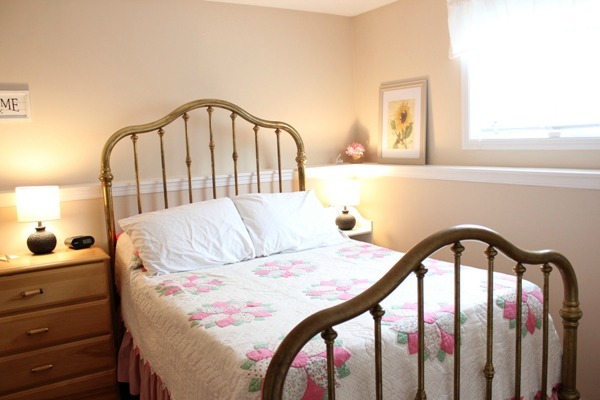 I wrote a similar post five years ago but I thought it was time for an update 🙂 The brass bed is an antique that has been in my family for many many years. It doesn’t polish up so good anymore though sadly. If anyone has any ideas on how to fix that please let me know. The quilt was made for me by my Aunt and Granny as a wedding present 22 years ago. It’s very special to me. Whether you have a dedicated guest room or are converting another room over, everyone appreciates a space that is clutter free. A clutter free space is a relaxing space so you want to make sure that everything is picked up off the floor and put away. Remember the floor is not a drawer (that’s what I tell my kids all the time!). 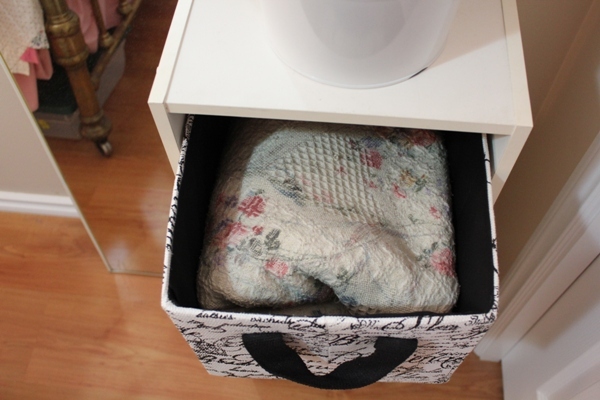 If necessary box up anything that clutters surfaces and stash boxes away in the closet or underneath the bed. 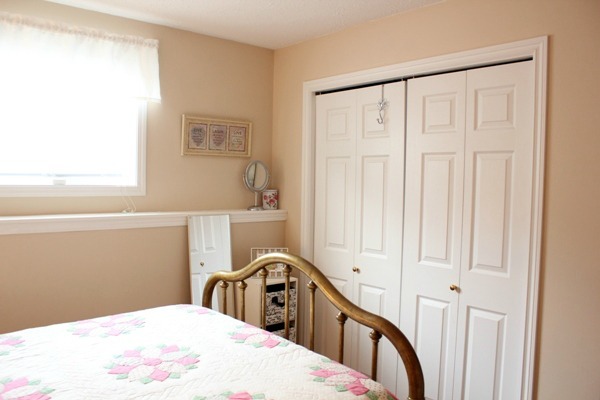 My guest room is tiny but the absence of clutter definitely helps make it feel a little more spacious. This is not mandatory of course but it’s a nice touch for guests to be able to tuck away some of their belongings if they want too. 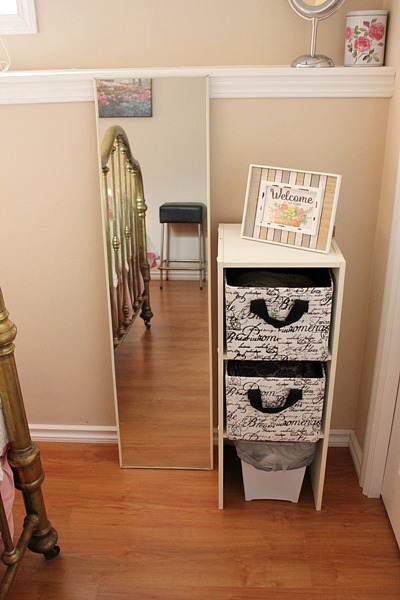 There isn’t a lot of space in my guest room to leave suitcases open on the floor so all the drawers in my dresser are empty to make life easier for my guests. Even when we used my daughter’s room as a guest space we tried to clear out at least one drawer for guests. 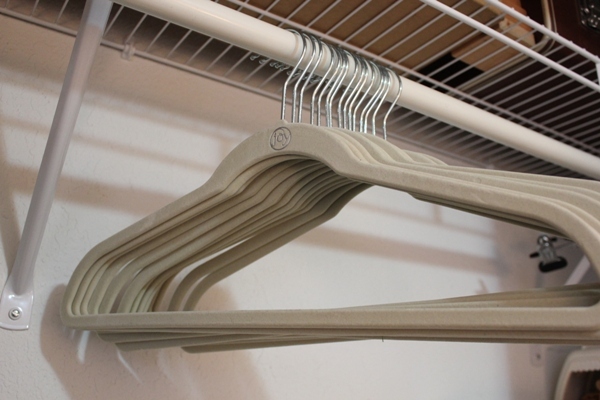 I don’t think a lot of closet space is necessary but for sure it’s nice to provide a few hangers for guests to hang up their nicer things that might wrinkle in a drawer. I absolutely love these space saving Huggable Hangers from Joy Mangano (affiliate link). 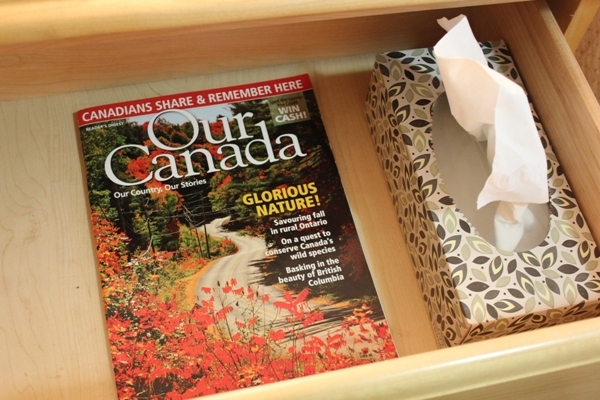 Don’t forget to add a box of tissues to your space for added comfort and magazines are just a nice thing to offer your guests for a little light reading if they so choose. In this room I keep both these items in the top drawer of the dresser tucked out of the way but close to the bed. A cozy guest room needs an extra blanket and an extra set of sheets. I keep both of these things in these black bins. 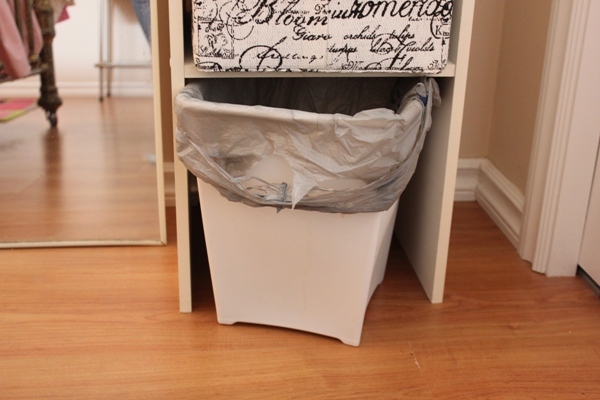 The extra blanket is kept in the top bin and the sheets in the other bin just in case of emergencies. You never know. Who doesn’t love a welcome basket full of goodies? I know I do! This is my favorite part of getting a cozy guest room ready. Seriously it’s so much fun for me since well it involves containerizing and all 🙂 I like to include little extra toiletries for guests like toothpaste, toothbrush, razors, lotion, shampoo, conditioner, ear plugs etc. I always bring any unused toiletries home from hotel stays because they really come in handy when you have guests who may have forgotten something. Now that I no longer have children using the guest bathroom downstairs and have more space in there, I also keep an extra stash of supplies, including feminine hygiene products underneath the bathroom sink. In addition, I always like to include a few snacks and treats. 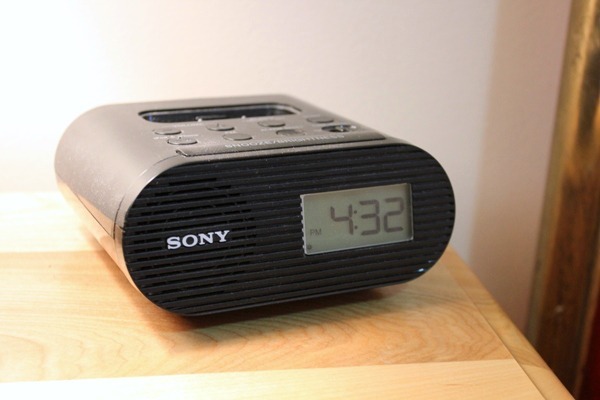 From experience I’ve realized that if guests get hungry after everyone has gone to bed they don’t want to go to the kitchen and risk waking everyone up. Same goes if they are early risers. I don’t want my guests going hungry that is for sure so I like to provide a few things for just in case. Water bottles are also a good idea. 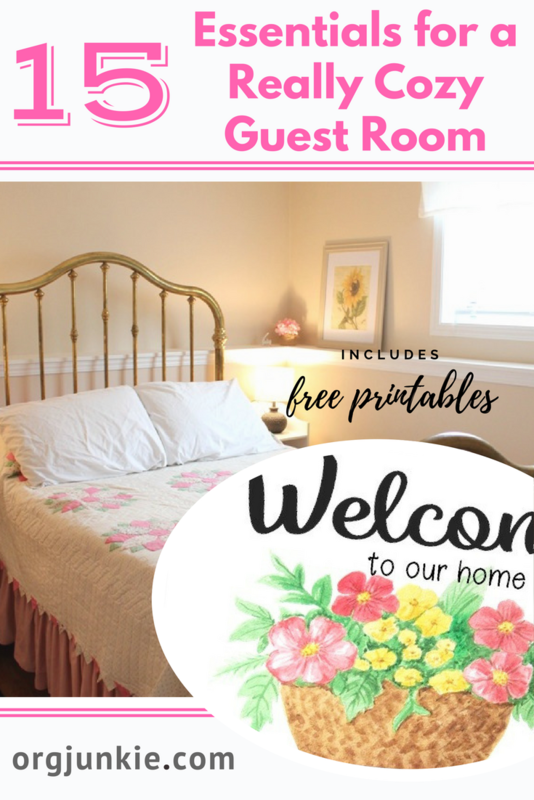 You can download and print the free printable Welcome basket tags by clicking on the link below. I printed them out here on bright pink card stock paper for fun but of course you can print them out on whatever color matches your space. A nice touch especially for those that might not have phones like my in-laws. 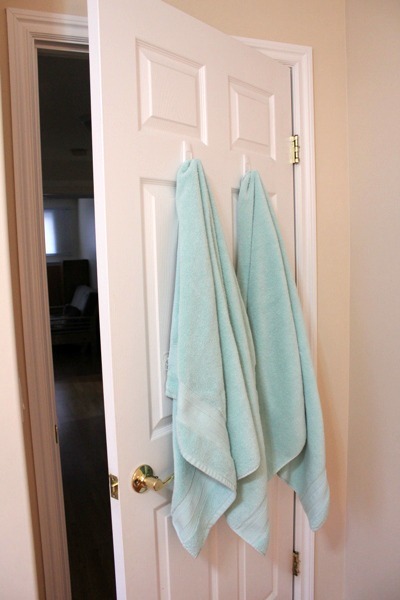 I always like to provide space for guest towels right in the guest room behind the door. This way if we have multiple guests, towels don’t get mixed up and used by someone else by accident. A couple of 3M Command Hooks (affiliate link) on the back of the bedroom door solves that problem. In the bathroom in a basket (but of course!) I also have a stash of facecloths for guests to use. I don’t want my guests having to get out of bed to turn off the light so naturally bedside reading lights make sense. 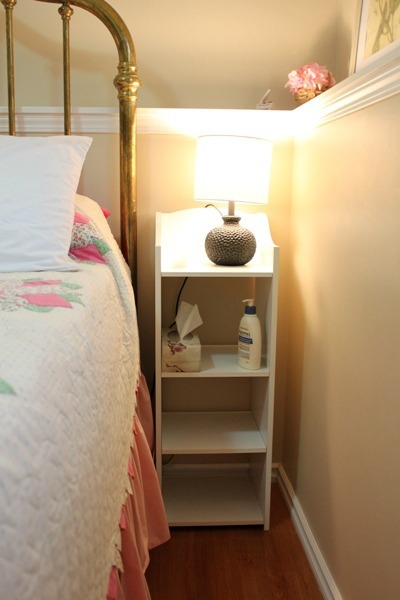 When my daughter’s room served as the guest room she normally had her bed pushed up against the wall so we would move it out in order to make it easier for two people to get in and out of bed and brought in an extra side table with light. 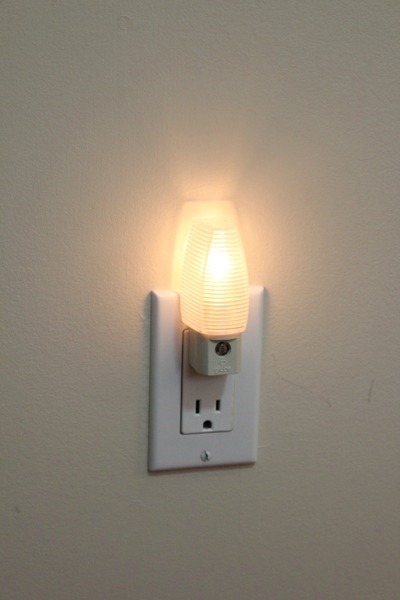 A nightlight in the bedroom and especially in the hallway so guests can find the bathroom at night is a very thoughtful touch. If not needed, guests can easily unplug them. 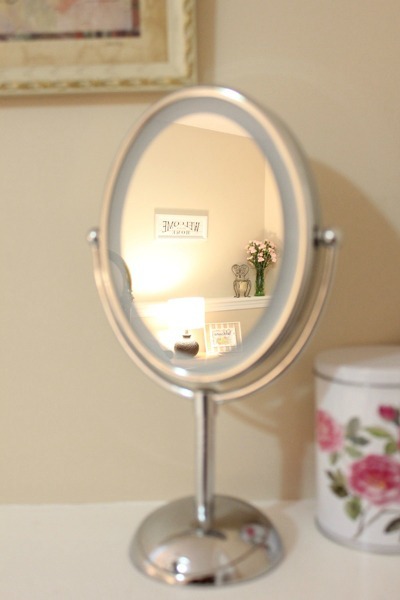 If your guests will be sharing a bathroom, they may want the convenience of getting ready in their bedroom. I always make sure to provide a mirror of some kind (and stool to sit on) just in case they want to do hair and makeup in there. With so many electronics to charge these days please always include a power bar for guests to use. One on both sides of the bed if two people are staying together will be very much appreciated. 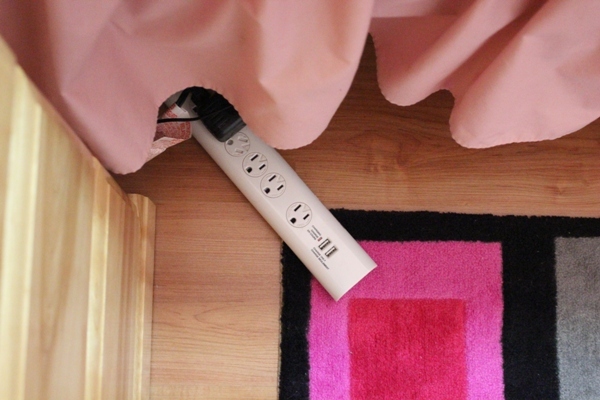 For convenience, you want your guests to be able to charge their phones by the bed and not on the other side of the room. I find this one is the one most often neglected. So much in fact that I now travel with my own extension cord wherever I go just in case. If you have guests staying for awhile and know they will need to do laundry during their stay, give them a convenient place to throw their dirty clothes. 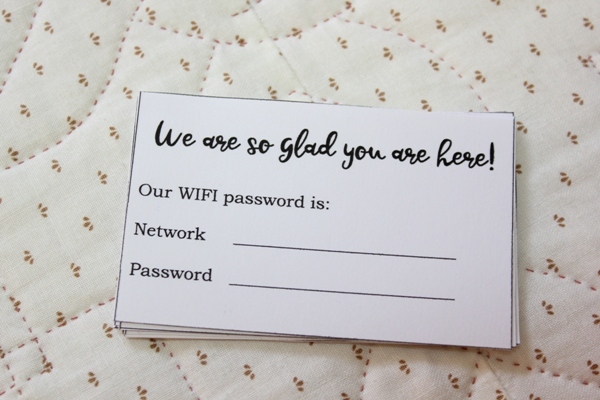 Guests of course need the password when they come over so I made up these little cards to pass along. Please feel free to download and print these out for free below if you’d like to use them too. 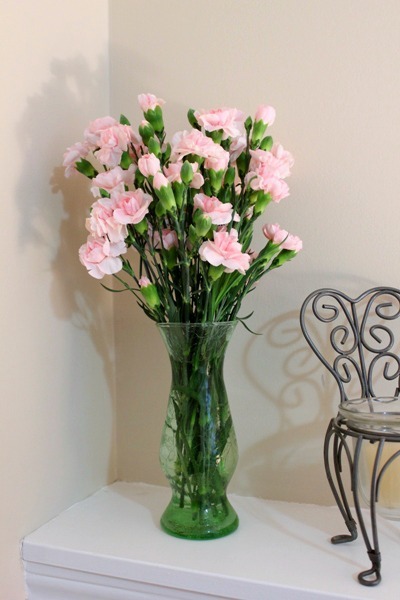 Fresh flowers look so pretty and inviting but also naturally make the space smell so lovely too. I find guests don’t like to ask for things and instead will often just make do in order to be nice. However if they don’t say we don’t often know what they need. For that reason I like to cover as many bases as possible by adding as many extra touches as I can think of. 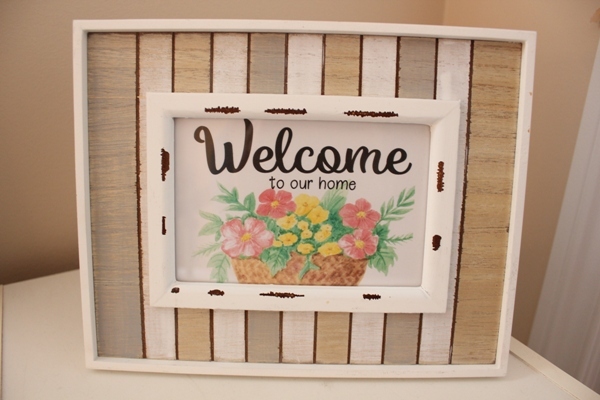 These little details will go a long way in making your guests feel cozy, comfortable and welcome. 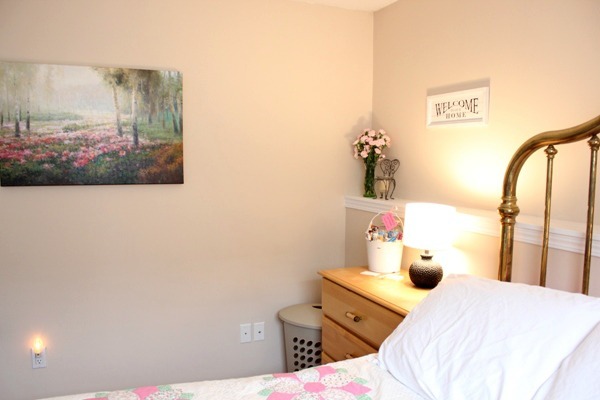 What else would you add to this cozy guest room list? This post contains affiliate links and I will be compensated, at no extra cost to you, if you make a purchase after clicking on my links. However, I only ever mention products I love and would recommend whether I was being compensated or not. Thank you so much for your support of my site! I love all you details Laura. I like to also have some slippers available for guest to use. With hardwood floors and if they visit in winter, slippers are an extra added touch too! Oh that’s a great idea, I’m totally going to include those. Thanks Simone! I think you’ve covered it all! 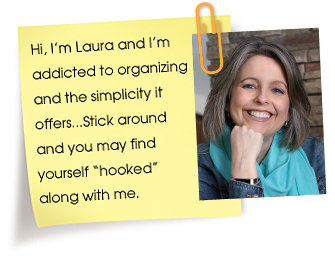 I love all your ideas, Laura. Great tip! I found it really helpful to add a really nice memory foam mattress topper as well. I also have some extra night clothes, robes and slippers in the closet. One of the things I have in my guest room is a small coffee pot, coffee, water and anything needed for coffee. My sister visits and she gets up EARLY, I found out she waited to come out until someone woke, I felt bad so I now think of anything I can and I ask guests. Another thing I did was use my guestroom as a guest. I only brought some clothing. It was an eye-opener. Address of your home and land line number if you have one.